MPBS Industries located in Los Angeles CA 90023 sells Table Top Meat Grinders. A meat grinder or meat mincer is equipment for fine chopping ('mincing') of, or mixing of raw or cooked meat, fish, vegetables or similar food. Meat grinders are use to grind or mince meat to make sausages, hamburgers, meat balls, meat loaf, etc. Meat grinders come in several different sizes (most grinder uses grinder plate sizes 12, 22, 32, 52, etc.) and can be used in various ways but in most restaurants, grocery stores and home use, the most common is the table top meat grinder. The smallest type of meat grinder is the manual grinder. The meat material is manually stuffed into the feeder. For all these small machines the Enterprise cutting system is used with one grinding knife and one grinder plate. These machines are very common everywhere in food processing but their throughput and production capacity is limited due to the small size and manual operation. 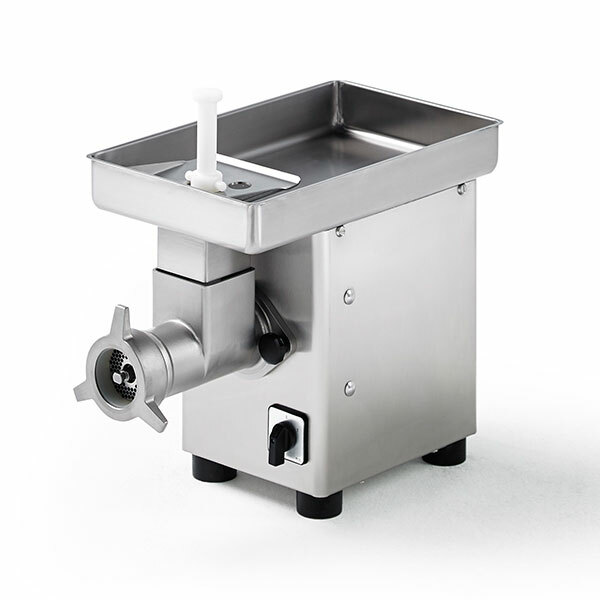 The intermediate size meat grinder has an opening diameter of up to 98mm. It is driven by a built-in single-phase electrical motor and available as both a table top and floor model. The meat is put onto the tray and continuously fed by hand into a vertical cylindrical hole leading to the feed auger. 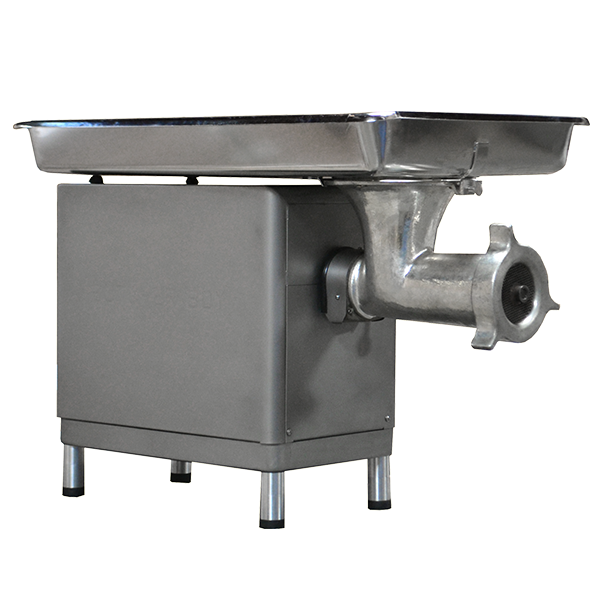 The meat or fat is forced by its own weight into the barrel with the rotating feed auger. 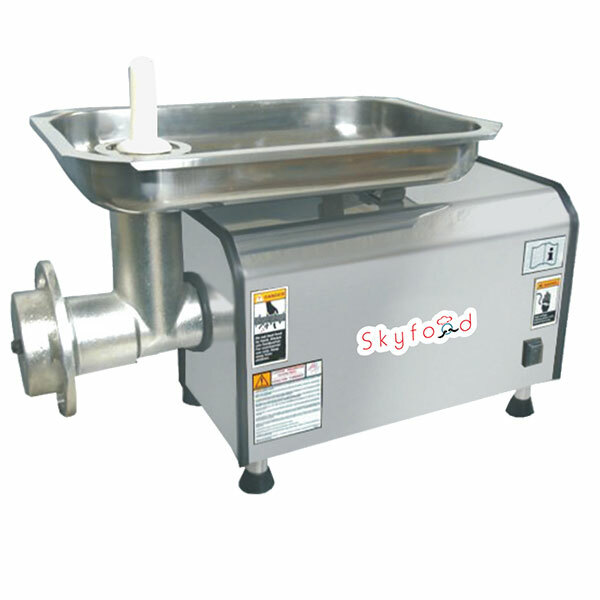 This type of meat grinder is the most suitable for commercial small-scale operations. Some brands use the Enterprise cutting system, others the Unger system. Some people use table top meat grinders to grind beef, pork, chicken, turkey and now fish. 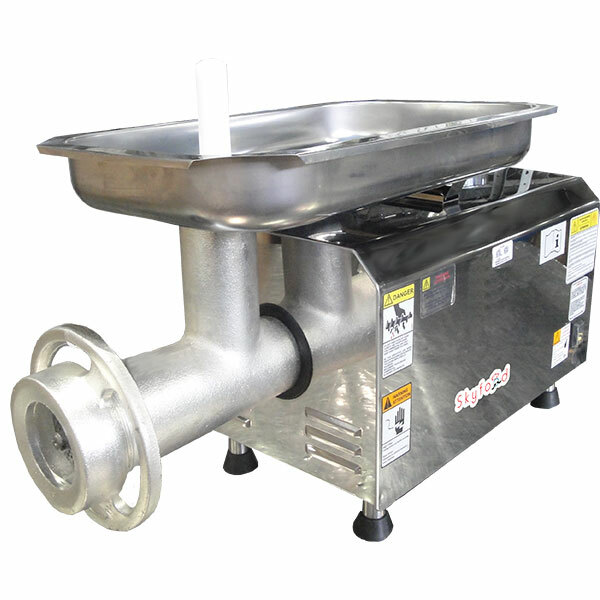 The tabletop meat grinders sold by MPBS Industries are commercial grade meat grinders used by professional, most are UL approved and NSF certified. 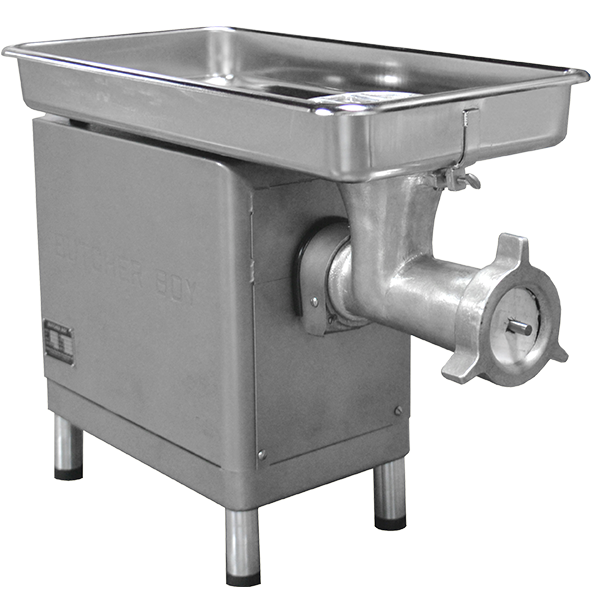 MPBS Industries represents Thunderbird meat grinders, Pro-Cut table top meat grinders, Value-Plus Meat Grinders, Butcher Boy table top meat grinders and German Knife Table Top Meat Grinder. The butcher puts cut boneless meat into a funnel, which is placed on the top of the grinder. From there the material goes on a horizontal feed screw. This feed screw is powered by an electric motor, squashes and partially mixes the food. At the end of the feed screw there is a knife installed directly in front of the fixed grinder plate. At this opening the minced meat comes out of the machine. The fineness of the meat depends on holes size of the grinding plate. 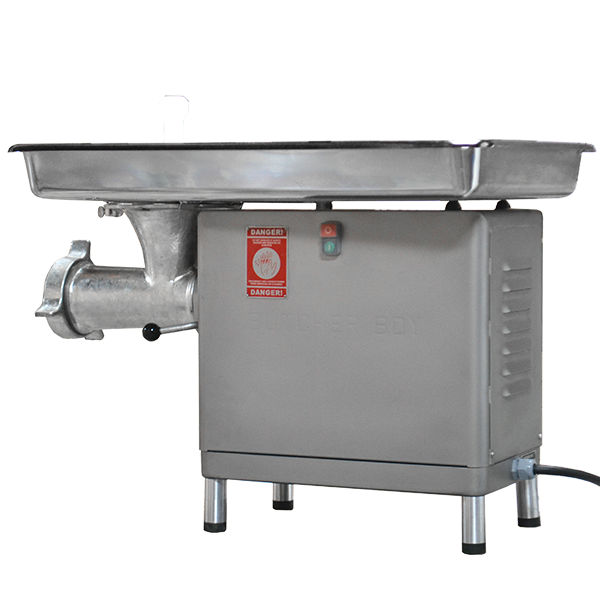 By changing the grinder plate it is also possible to produce breadcrumbs or fill sausage. After the drop from the retainer, it is possible to change the grinder plate. 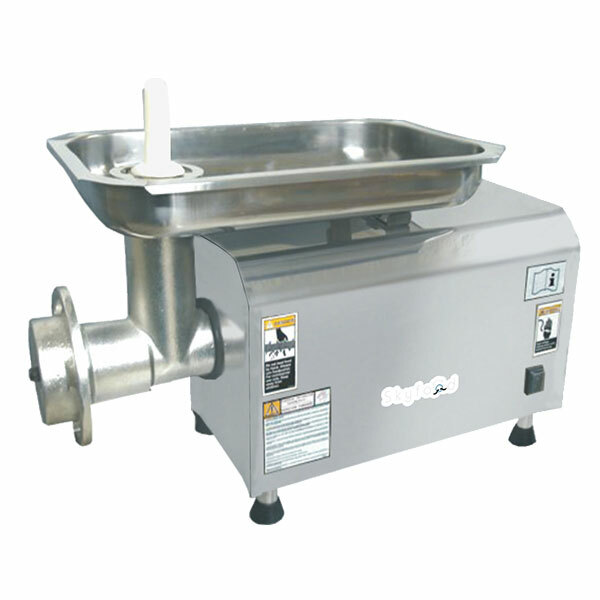 Besides the domestic manually or motor operated grinders, there are also grinders for butchery (table or shop grinders for example) and for the food industry. Some large machines are able to produce several tons per hour. 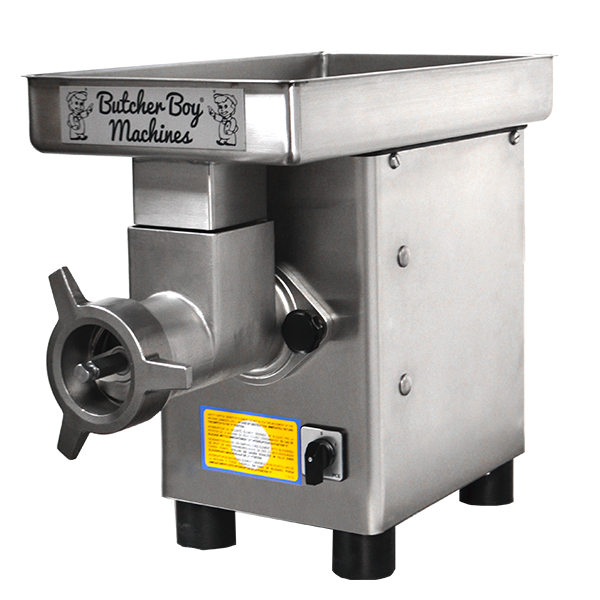 We also provide parts worldwide and local service in the Los Angeles and Southern California area for Butcher Boy grinders, Biro grinders, Tor-rey (Pro-Cut) table top grinders, Thunderbird meat grinders, Hobart meat grinders and Hollymatic meat grinders. Please feel free to contact our professional sales and service staff to answer any questions you have on table top meat grinders. We also sell the accessories used with the grinders (ex. stainless steel dump buggies, storage bins, meat lugs, stainless steel trucks, etc.). The grinders should be cleaned after every use.